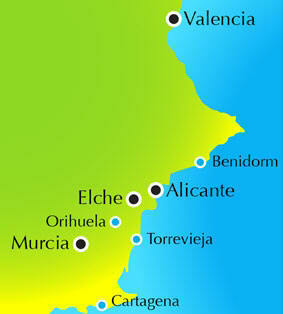 Alicante golf Alicante Course Costa Blanca. The legendary Spanish player Severiano Ballesteros designed the Alicante Golf city-course, which offers a good challenge for pros and amateurs alike. It is located at the foot of the “Sierra Grossa”, north of Alicante and near the beach of San Juan on the Mediterranean Sea from spain-info Spain. TomTom Golfer GPS Watch – Dark Grey. Take exit 7 of the A-70 motorway, towards Alicante Norte/ Vía Parque. El Altet (Alicante) 15 km. The legendary Spanish player Severiano Ballesteros designed the Alicante Golf course, which offers a good challenge for pros and amateurs alike. It is located at the foot of the “Sierra Grossa”, north of Alicante and near the beach of San Juan on the Mediterranean Sea. 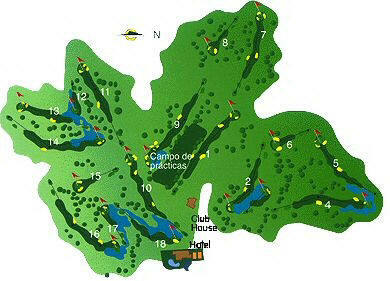 It is the only 18 hole par 72 course on the Iberian Peninsula which consists of six par 3, six par 4 and six par 5 holes. 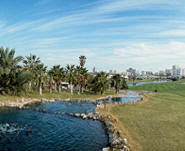 Alicante Golf Course offers you plenty chances for a birdie and a lot of variety on every hole. Along the course there are seven water hazards, so getting used to playing between the obstacles is important. On the fourteenth hole you will find a very particular obstacle. In order to arrive at the green, you must pass the ruins of the “Villa Ferrer”, a Roman country house from the year 1 BC that was discovered during the realisation of the course. 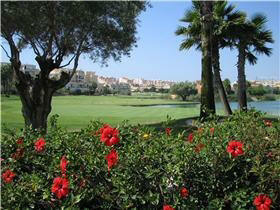 Alicante golf course is known as one of the best maintained golf courses in Spain. And if you like the Mediterranean cuisine: the restaurant might even be more famous for its paella! 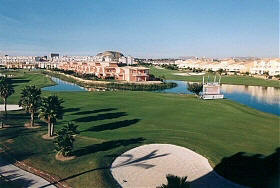 This course was designed by Seve Ballesteros and opened ion 1998. It is a modern 18 hole par 72 course on the outskirts of Alicante close to the San Juan beach and is a course for careful players with a number of water hazards on the course and has a handicap restriction of 36 for men and women. The fairways are wide and the greens ample with strategically placed bunkers. The course is also home to the luxurious Golf Hotel. This four star rated hotel is tastefully decorated and boasts all the facilities of a luxury hotel. Host to a health and beauty centre, a range of specialist treatments are also available. New!This one bedroom apartment is about 45 m2 and is on the on 12th floor, east facing position and bright. 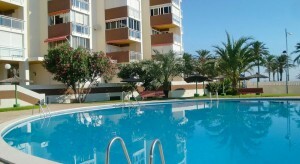 Is located in a resort, in a quiet, sunny position, 50 m from the beach crossing the road . In the living/dining room there is a TV, electric heating and boiler (50 litres). There is a terrace with furniture and a small kitchen with oven, micro wave, freezer and electric coffee machine. You will enjoy a lovely view of the sea, the swimming pool and the garden. As facilities there is a washing machine and a reserved parking. For shared use with the resort is the grounds (fenced), nice garden on different levels with lawn and trees, swimming pool (01.01.-31.12. ), paddling pool, outside shower, tennis, barbecue, children’s playground (slide, swing). In the complex there is a lift., parking in the grounds, supermarket 800 m, restaurant 500 m, bus stop “San Juan Playa” 300 m, railway station “San Juan Playa” 100 m, sandy beach “San Juan” 50 m and a golf course (9 hole) 500 m.
Alicante Golfing also boasts a good commercial zone, namely the “Ronda Shopping Centre”. This houses a selection of shops, cafes and restaurants of varying sizes, set out in the style of a typical Adalusian village. Most of this is pedestrianised, well laid out and an asset to the course and residential zones.